Physio: So, tell me. How did you injure your finger? Physio: Oh! Another climber. Of course. 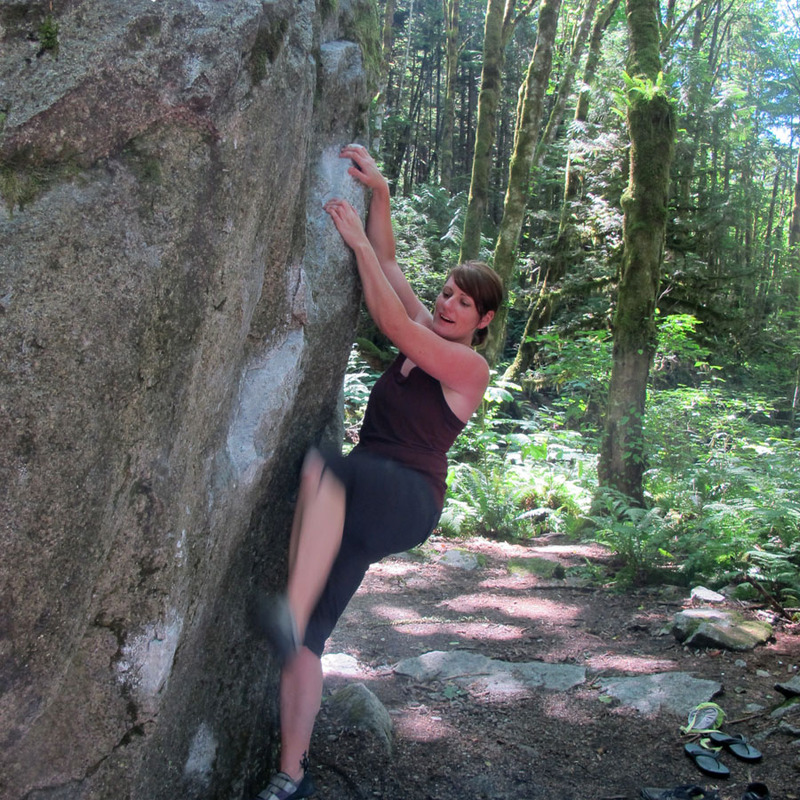 Me: So….when can I start climbing again? Physio: Climbers! You are ALL totally addicted! Just the slip of a foot can lead to a sprained ankle or wrist. This sport is not for the faint of heart! This pretty much sums up many a climber’s life. You fall in love with the sport (or perhaps have been in love with it for years, or your whole life), you get injured and all you want to do is get back to climbing ASAP. I injured my A2 pulley tendon around September 10th after my foot slipped on a crimpy hold in the gym this summer and now it’s December 2nd, and after around 6 weeks nearly full rest, a lot of therapy and a lot of patience I still can’t fully straighten my finger. After the injury first occurred I figured I could at least climb one handed, right? Yes, this is how addicted I am. I tried that a few times with my climber boyfriend, just wanting to be at the gym and not lose conditioning and then realized this was not the wisest, or easiest endeavour. I at least could watch him climb and be in my happy place. But, the reality of the sport of bouldering in particular is that it is incredibly hard on the body, and chances for injury are high. As I’ve discussed with a few other climbers – in bouldering there is a higher chance for a slightly more minor injury and in all other kinds of climbing there is a lower chance of a bigger injury (like falling on your head for example.) It’s what it is and I don’t know a lot of boulderers who aren’t nursing some kind of tendonitis, joint pain, or injury at one point or another. So, as I near the end of my first major climbing injury I have a few tips that might help you along the way too. I’m not a doctor, but I’ve sure seen a lot of therapists in my life and slowly feel that I have learned some knowledge along the way! 1. See a doctor or physiotherapist immediately. Depending on the severity of your injury, the first thing to do is book an appointment with a specialist so that you can have all the tips and advice you need right away to treat your injury and to have it heal properly. This really makes all the difference. As soon as I got a special night time cast for my finger to regain the straightness it made all the difference. 2. Rest. Rest. Rest again. Repeat as needed. This one is the biggest key, the seemingly easiest to follow and yet the most aggravating for a climber. Your body needs time to heal. Listen to it and rest it. 3. Remember that you aren’t going to lose all your conditioning as you recover. This one freaked me out. I had worked SO hard to build the right muscles, train hard and get to a level of climbing I was pretty happy with having just started in May. I was terrified that I was going to lose all of that by resting. I was happily wrong! Sure, I lost a bit of muscle strength and was a bit rusty on some of my technique, but the rest time was actually really good for my body. My shoulder tendonitis got better and I focused on other exercise, strengthening my core and legs and I can see the results of this now that I’m back at climbing. 4. Ease back in gradually. You can’t go from injured to climbing caves in one day. This one takes a whole heck of a lot of patience. As soon as I got back to the gym I was so happy to be there that I wanted to try all the hard problems, but I had to stick to big fat juggy problems (giant holds that are easy on the hands) and still need to be very careful. In some ways it’s almost good because it makes you focus hard on your technique and being a careful climber. As a way of easing myself back into bouldering my boyfriend took me to Cliffhanger, a ropes gym next to the Hive for my first try on the ropes. 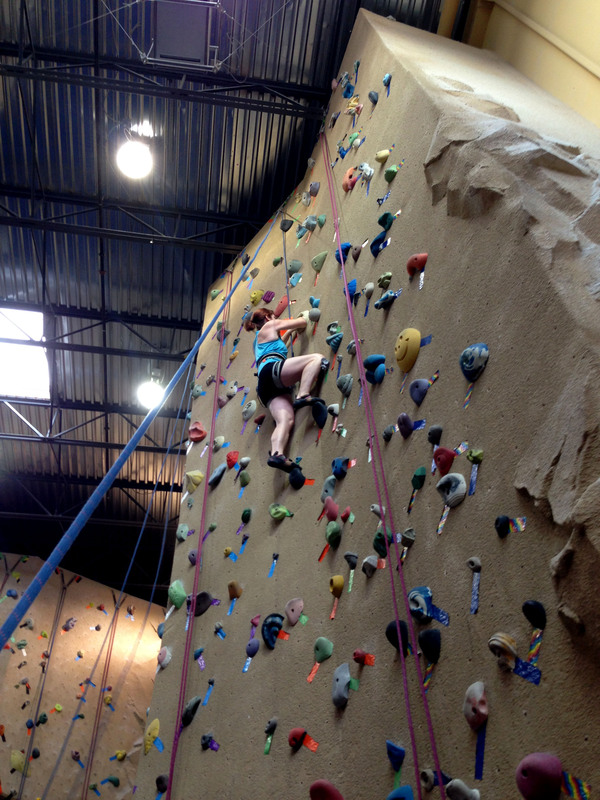 It’s MUCH easier on the body and was a great way for me to be climbing without putting too much pressure on my finger. 5. Know that your mind will need recovery time. This one surprised me the most. I had a lesson with my instructor the other day and she noticed right away that I am climbing very tentatively at the moment. I’m scared to hurt myself, scared to put weight on the finger and I don’t trust myself fully right now. This unfortunately creates tension in your back and shoulders as well as unsure feet which is a recipe for a bumpy climb (and not intentionally bumpy). She told me this is totally normal, though and that you just have to work on regaining that mental strength as well as the physical. Just knowing that made a huge difference and made me a whole lot less frustrated with myself. 6. Perhaps this should be number one – injury prevention! There is a whole article within this point, but injury prevention is about knowing your body, training properly, warming up properly, pacing yourself during climbing and knowing when to call it a day. Trust me, it’s much better to quit your climb half an hour early than injure yourself in a slopping tired attempt at the end. But, as I know well, having the discipline to stop when needed…not so easy when you’re having a blast! For more tips and advice check out this article from Climbing Magazine. Happy climbing and hope you stay injury-free!